What did these German soldiers believe? There is a lot in the news at the minute about the power of religious faith as a motivational factor. But we mustn’t forget that a study of Nazism teaches us that it is perfectly possible to have fanatical faith without believing in a traditional religion at all. Hitler, for example, despised Christianity, yet he felt compelled for purely pragmatic reasons – especially when starting out as a political leader – to sometimes speak well of the religion in public. He could do little else, he felt, because a number of his followers were Christians. But Hitler put a very different slant on traditional Christian beliefs. In a speech in April 1922 Hitler said: ‘My feeling as a Christian points me to my Lord and Saviour as a fighter. It points me to the man who, once in loneliness, surrounded by a few followers, recognised these Jews for what they were and summoned men to fight against them and who – God’s truth! was greatest not as a sufferer but as a fighter. In boundless love as a Christian and as a man I read the passage [in the Bible] which tells us how the Lord at last rose in His might and seized the scourge to drive out of the Temple the brood of vipers and adders. And, as I wrote in the Dark Charisma of Hitler: ‘It was possible for Nazis to make personal – and blasphemous – comparisons between Jesus and Hitler. For example, that both leaders had waited until they were 30 years old before beginning their ‘mission’, and that both promised redemption from the suffering of the moment. In order to support such views the Nazis – not surprisingly – ignored the historical record and claimed that Jesus was not Jewish. Hitler wanted, in the long term, to get rid of Christianity, but he still recognized the immense value of ‘faith’. He dreamnt ‘of a state of affairs in which every man would know that he lives and dies for the preservation of the species’. 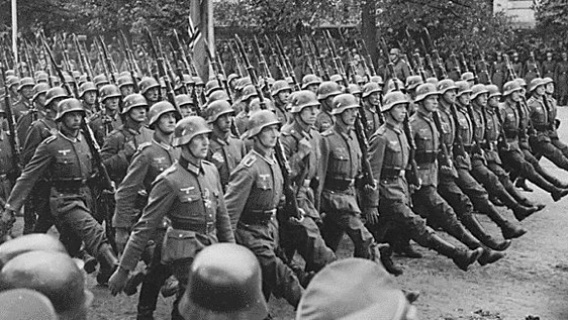 He wanted his soldiers to have fanatical ‘faith’ in him and in Germany – not in some supernatural being.